My Series Sunday pick is Abiding Hope, the 2nd book in the Genesis House series by Angela Benson. Abiding Hope continues the momentum by focusing on the lives of Shay and Marvin Taylor, the founders of Genesis House. Their marriage began to fall apart in the first book Awakening Mercy from the death of their six-year-old son. Now the couple has left Atlanta and moved to Mississippi in hopes of a new start. Shay desperately wants a second baby despite medical advice; Marvin feels it will only bring more pain. Their faith in God and each other is tested in this second installment of the Genesis House series. The content is emotional and uplifting. The story was slow-paced and not quite as engaging as the first book of the series. Perhaps I got my hopes up too high when I realized the story would be focused on Shay and Marvin's marriage and loss of their child. While it did focus on this couple, I just expected more. Again, this series is a mix between the Blessings series by Beverly Jenkins and the Reverend Curtis Black series by Kimberla Lawson Roby. If you are a fan of either series or like Christian inspirational fiction, you will enjoy the work of author Angela Benson. To date, these are the only two books in the Genesis House series. Catch up now before the third installment Enduring Love releases later this year. (My guess is Angela Benson will write about new characters Vickie and Daniel). You may download the eBook version of Abiding Hope for less than $4. 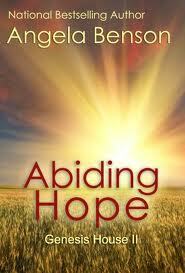 *NOTE TO NOOK FRIENDS: You may borrow my eBook copy of Abiding Hope using the "Lend Me" feature.